Every book we publish holds a story, but sometimes the 'story behind the story’ is as fascinating as the plot itself. If you’re considering publishing a book, then you could learn a lot from SilverWood author Gillian Fernandez Morton. In 2018, Gillian proudly published her novel, 'Bombweed,’ after it had been in the family for over half a century. We spoke to Gillian to find out what it was like turning a private family treasure, into a novel that thousands of people will enjoy. In the 1940s Gillian’s mother Margaret wrote a story about the war. The manuscript dealt with love, loss and the daily upheaval of life at that time. When she passed away in 2005, Gillian and her sister inherited the unpublished work. They had piles of badly-typed pages, but little idea what to do next. Would they be able to finally realise Margaret’s dream? In 1947, Margaret Smith finished a four-volume book about the war years. She took it to a publisher, but was told that it was 'too soon’ for a book like hers. The book focused on people's everyday lives and the enormous psychological impact of war. Back then, people wanted tales of heroism, not the bitter truth. The sad story is that after this Margaret left her manuscript on top of a dusty wardrobe. She tried again to get it published in the 1980s, was unsuccessful, and so back to the top of the wardrobe it went. When Margaret died in 2005, her daughter Gillian decided to read the book once and for all. She’d never read the whole work before because it felt too intimate. Having read it, Gillian knew it had potential, but had no idea how to turn the typed pages into a modern novel. Like many other authors, Gillian didn’t know how to set about editing or publishing this work. But she knew the period detail and her mother’s psychological understanding were worthy of wider appreciation. Gillian also worked in child mental health, so she knew first hand that her mother’s book held truth and merit. She asked friends what to do. Should she scan it page by page? How long would that take? Luckily for Gillian, she was able to get the dusty pages turned into a word document in London. She returned home with a memory stick and lots of ambition. But she soon hit another roadblock, the length of the document was daunting. Thanks to courses and writing groups, the enormity of editing the book started to dissipate. Working closely with her sister, Maureen, Gillian managed to slowly edit the book. They talked regularly, compared notes and memories. The process of editing 'Bombweed’ brought Gillian and Maureen into daily contact. They exchanged memories of their mother, the characters in the story, and talked regularly about their childhood. They added in details to honour their mother, and with care and consideration, began to make sense of the past. 'We exchanged details of our memories of the war, our father, and summers on a farm in Wiltshire after D-Day, just after I was born.It’s been immensely therapeutic,’ Gillian said. As many other authors will tell you, editing is the hardest part of the writing process. Gilllian felt very close to the subject matter. She attended workshops to help edit the text, but the fact remained that reducing the size of 'Bombweed’ was emotionally tricky. Through a friend, Gillian heard about SilverWood Books in Bristol. She and her sister Maureen came in to meet us and decided to finally get the book published. They both felt 'a great relief.’ After a year of approaching agents and publishers, but with no luck, they had found someone whom they could trust. 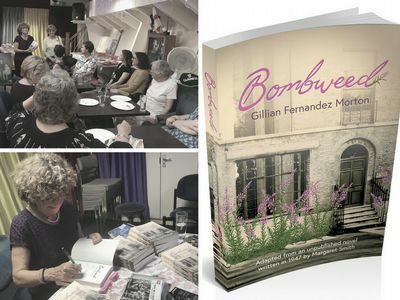 Gillian celebrated the publication of 'Bombweed’ in 2018, in both London and Bristol. Since then, Gillian and Maureen have appeared on radio, had interest from local press, museums and libraries. The book launches were a celebration of a huge achievement and the realisation of a lifetime’s worth of work. Buy a copy of 'Bombweed’ here. If you’re about to start your publishing journey, get in touch with us. We can help you create a professional quality book and will be with you every step of the way.